These dense and delicious Chocolate Surprise Bars are perfect for the upcoming fall season! 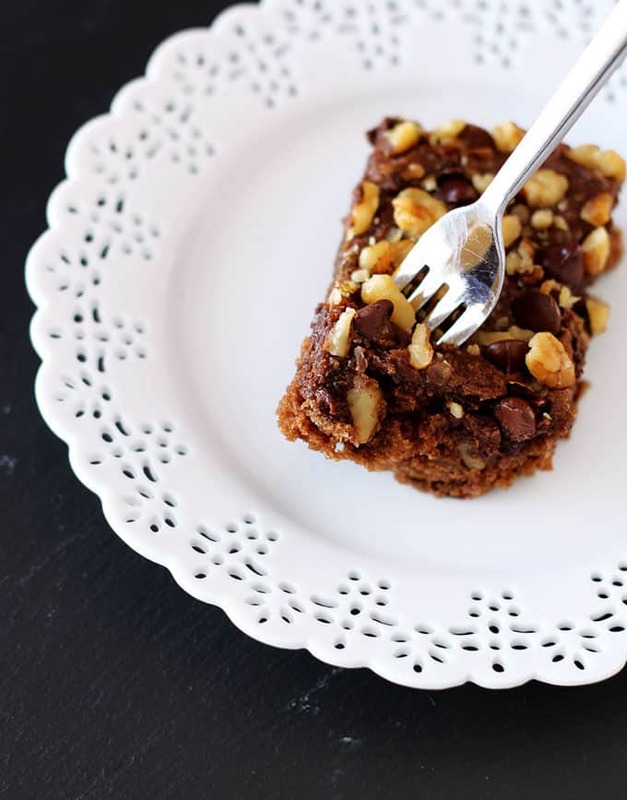 Topped with crumbled walnuts and rich chocolate morsels, these are the easiest and most delicious homemade bars you’ll ever make! So what is your favorite type of dessert? Mine is anything chocolate. Chocolate, chocolate, chocolate…yep literally anything that has any aspect of chocolate in it, I’m all over it. 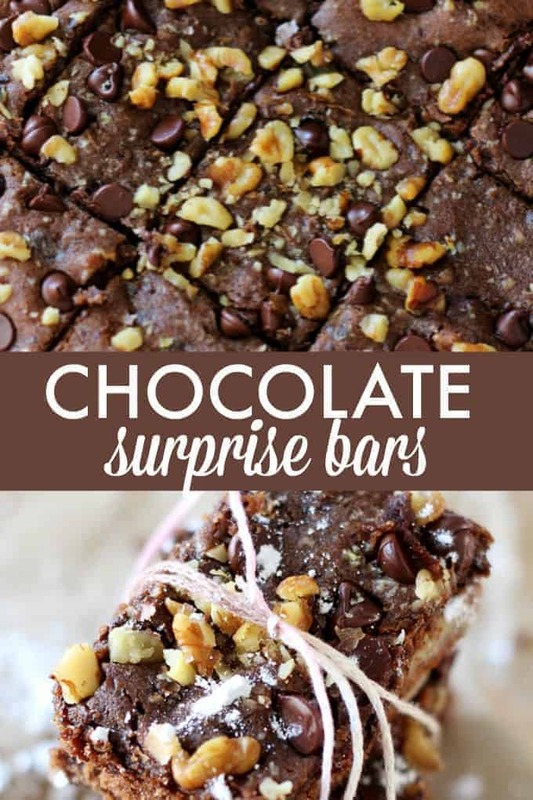 Ya’ll, these Chocolate Surprise Bars are above amazing. I mean…AMAZING! And let me tell you, I was indeed surprised when I found out these bars had dates as one of the ingredients! Dates contain a lot of dietary fiber and are high in iron. 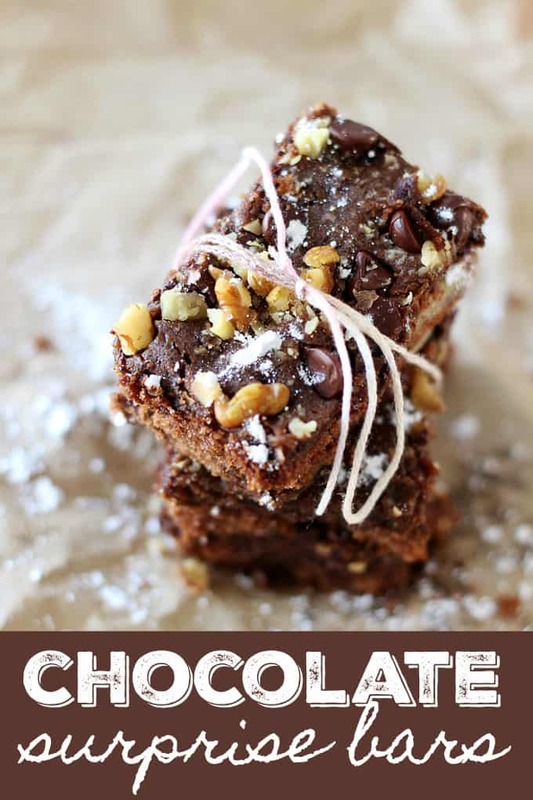 And let me tell you, dates taste so delish in these Chocolate Surprise Bars! 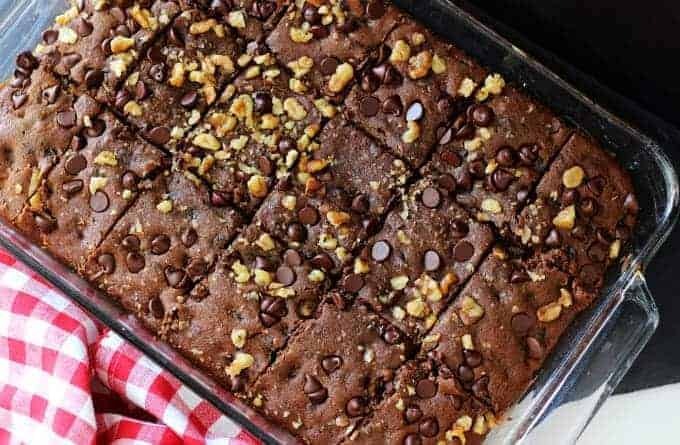 These rich and chocolaty bars are super easy to make. You’re going to need a sifter to sift the flour, cocoa and salt. Sifting dry ingredients really helps equally mix the salt, cocoa and flour. I find that when I sift the dry ingredients in this recipe, the bars come out moister so make sure you sift your dry ingredients! These bars are definitely a dessert. They are a bit too sweet to eat for breakfast but they do pair really well with a nice hot cup of coffee! I can’t keep my hands off these bars! They are like a cookie and a brownie in a bar! These are not only a crowd pleaser but they are a kid pleaser, too! My kids constantly ask me to make these. I make them to have around for my kiddo’s sleepovers and we take them to class parties at school! 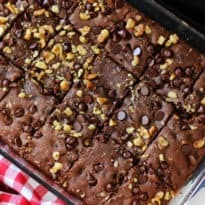 These Chocolate Surprise Bars are also the perfect dessert for bake sales, to take to a potluck or have around the house for a yummy sweet treats! These bars scream fall weather and I guarantee your entire family will love these! Enjoy! For more fall recipes, check out my Pumpkin Chocolate Chip Muffins and Apple Pumpkin Spice Cake with Butter Rum Glaze. You might also enjoy this Mocha Cake. 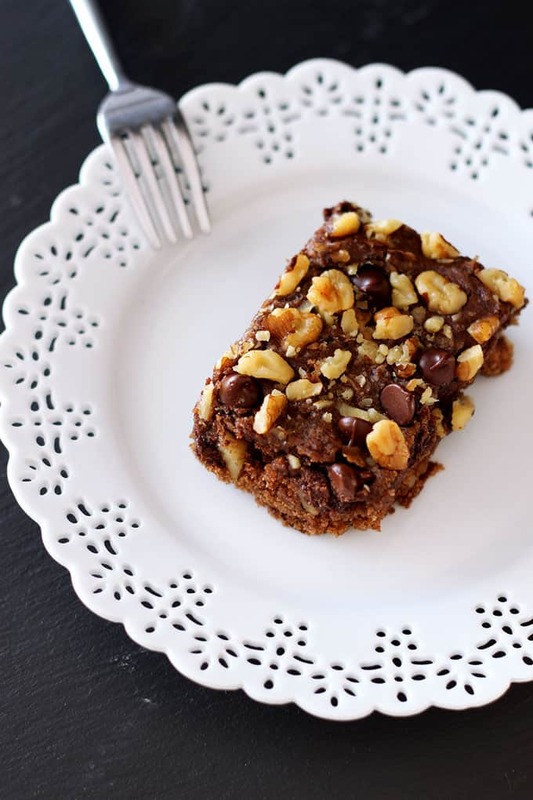 Topped with crumbled walnuts and rich chocolate morsels, these are the easiest and most delicious homemade bars you’ll ever make! Place chopped dates in a bowl and cover with baking soda and boiling water. Let the mixture cool completely in the refrigerator or freezer. Using a Kitchen Aid or a hand mixer, whip the softened butter and sugar together until well blended, about 45 seconds. Add in the eggs and mix well to combine. Sift the flour, salt and cocoa powder together. Ensure you have 2 cups of the flour mixture after you sift. Add the dry ingredients to the wet ingredients slowly and stir. Once the date mixture is completely cool, fold in the date mixture, ½ cup of the walnuts and chocolate chips. By hand, mix well with a large spoon and pour batter into a 9×13 glass Pyrex dish. Sprinkle a handful of chocolate chip morsels and walnuts on top of the batter. Once bars are completely cooled, cut into squares and dust with powdered sugar.